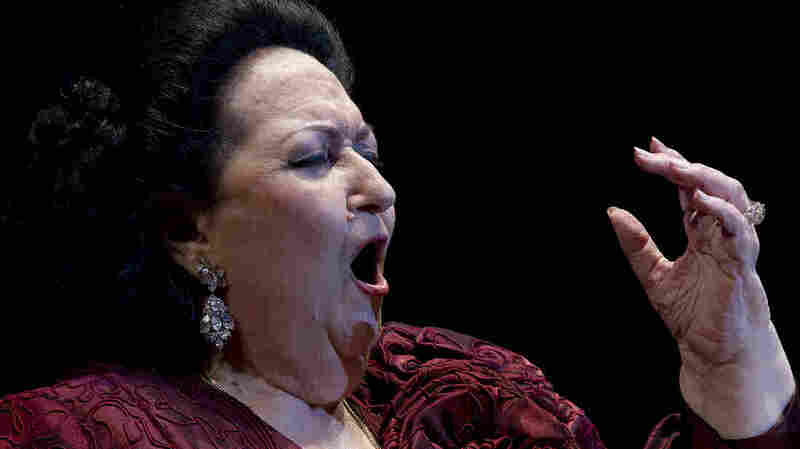 One Mesmerizing Moment With Soprano Montserrat Caballé : Deceptive Cadence The revered Spanish soprano, who died Saturday, spins out silvery threads of tone in her recordings, the likes of which no one has ever matched. Soprano Montserrat Caballé, in concert in Marbella, Spain, in 2012. Caballé "remains the single most glorious sound I've ever heard from any human voice," critic and University of Southern California professor Tim Page told me in 2010. And though I regret never hearing Caballé live on stage, she left a staggeringly wide array of recordings that proves Page's appraisal. Caballé, perhaps more than any other opera singer, has the magic to bewitch even the most hardened opera skeptics — and there's one secret weapon I've turned to over the years when attempting to convert doubters or the merely opera-curious. Saturday night, when friends were over for dinner, I played her 1974 recording of "D'amor sull'ali rosee" (from Verdi's Il trovatore) and, once again, Montserrat mesmerized us. All you need to hear, really, is 23 seconds from the aria's opening recitative section, which is where this video begins. Notice how, on a single breath, she rises effortlessly to a sweet B-flat on the word "pietosa" (pitiable) and then floats a seemingly endless, creamy, silvery thread of perfectly supported tone on the word "sospiri" (sighs). You're left breathless just listening to her. This is why I love opera. That a voice can not only physically sustain those long, flowing lines of melody, but then add a painter's palette of coloring to achieve emotional and dramatic depth, is something that continues to amaze me. Born April 12, 1933 in Barcelona, Caballé, whose full name is Maria de Montserrat Viviana Concepción Caballé i Folch, came from a humble background. At one point in her youth she claimed only a single dress to wear. At age 8, she taught herself to sing an aria from Puccini's Madama Butterfly. After formal studies, she joined the Basel Opera in 1956. Her big break came in 1965, when she filled in for an ailing Marilyn Horne in a New York concert version of Donizetti's Lucrezia Borgia. From then on she became associated with the florid, intricate and punishingly difficult bel canto repertoire of Bellini, Donizetti, Rossini and early Verdi, although she also excelled in music as diverse as Mozart, Richard Strauss, Brahms, Puccini and Spanish zarzuelas. She even sang a campy duet, "Barecelona," with Queen frontman Freddie Mercury. Even as Caballé's career was first rising, the most perceptive critics could hear a legendary voice in the making. "The supported soft tone, rounded and warm, carries through the broadly phrased lines, swelling on a long sustained note to be joined pianissimo to the phrase 'et lux perpetua,' allowing the voice to bloom, and finally to crown the whole passage with the B-flat taken from an octave below without lifting or break of filament, held firmly, very softly, and very beautifully." Regardless of your operatic leanings, and all the technical vocal jargon aside, what we are left with is simple. Like Tim Page said: It's the human voice, vibrant in its most beautiful condition. Who could argue with that?